Palm sugar is a healthy natural sweetener that has been used for thousands of years in South-East Asia. In Thailand palm sugar is an important ingredient that is used daily in many Thai dishes. Palm sugar is still made in the traditional way by collecting the sweet sap from the cut flower buds of coconut palm trees. Palm trees start to flower when they are about 15 years old, if the flower buds were left to mature they would form into coconuts. Typically palm trees that are used to make palm sugar are short as it is easier to harvest the flower buds. The flower buds are gently bent downwards and tied in position; this will help the sap to flow more freely. The ends of the buds are cut off and plastic tubes are tied below to collect the sap overnight. A few pieces of bark from a 10-year-old Payorm tree are placed in each of the plastic tubes; this prevents the sap from fermenting. The flower buds are freshly cut back each day to re-start the flow of sap; this is repeated until the bud has been cut down to the flower stem. Traditionally the sap was collected in short lengths of bamboo, you can see some of these in the video. However, the plastic tubes that are used nowadays are not only more hygienic but they help to prevent small animals from stealing the sweet contents. 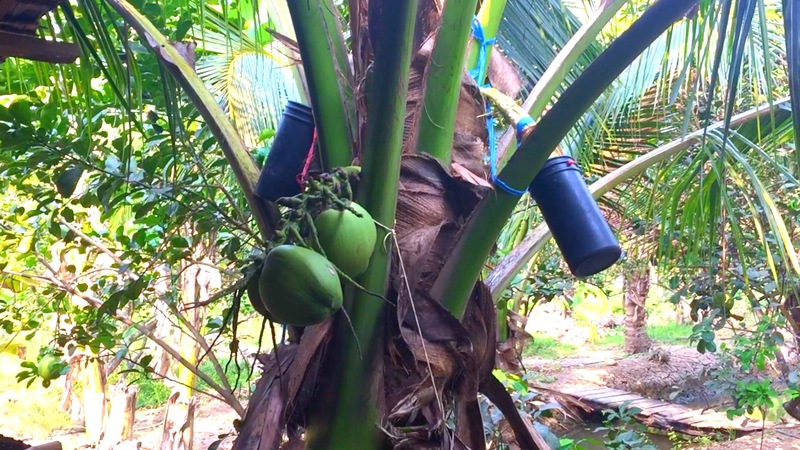 Every morning the plastic tubes are collected, each one contains about a cup full of the sweet watery sap that is then transferred to larger containers. The woks are cleaned with water and each is filled with the sap that is poured through a course filter. The trapped pieces of bark from the Payorm tree and other debris are discarded. At this step, each wok contains approximately 30 litres of sap. The plantation provides all the firewood that is needed. Dry palm tree wood, leaves and coconut husks are collected and the oven is stoked and started. Collecting the firewood and feeding the oven is a continuous process that goes on for several hours until all the sap has been processed. The oven is relatively simple, not much more than a traditional open fire at one end and a tall chimney at the other. In between the fire and chimney, there is a hollow horizontal chamber with large circular openings in which the woks are cradled exposing their bases to the heat. The oven is housed in a simple open-sided covered area with large openings in the roof; this allows all the smoke and vapor to escape by natural ventilation. The woks are heated and the sap is boiled for about 90 minutes to allow the liquid to evaporate. This process must be started within a few hours after harvesting the sap to avoid it fermenting into a sour liquid. As the sap starts to boil each wok is covered with an open topped woven basket, this stops the sap from overflowing from the wok. The foamy residue that is formed contains the impurities and is regularly removed; once it is allowed to cool any clear liquid is returned to the wok. With experience, the consistency of the mixture shows when it is almost ready to be removed from the heat. What is left in the wok is thick boiling syrup that smells of sweet caramel. The wok is turned for a few minutes over the heat to gently stir and avoid burning the syrup, and then it is removed and the cooling process begins. At this step, the wok contains approximately 5kg of hot palm sugar. A special tool, that is very heavy, is used to start to gently stir the palm sugar that helps it to cool down rapidly and start to thicken. As the consistency of the palm sugar starts to get thicker the tool is used to spin and aerate it for about 20 minutes. Again, with experience the consistency and colour of the palm sugar shows when it is ready to be packaged. The wok is transferred to the packing station and it is packed into small baskets that are made from folded banana leaves. At this step, the palm sugar is still warm and has the taste of the most delicious fudge that you can imagine. Palm sugar is sold in various forms and shapes that you can see in most Asian supermarkets. As palm sugar is not highly processed it’s appearance and taste can vary depending on many factors. However, if you are looking for a good quality palm sugar make sure that the colour is not too light as this indicates that it is probably mixed with cheaper cane sugar. A good quality palm sugar, especially one that has been made in Thailand, has a sweet taste almost like fudge with a slight hint of caramel.